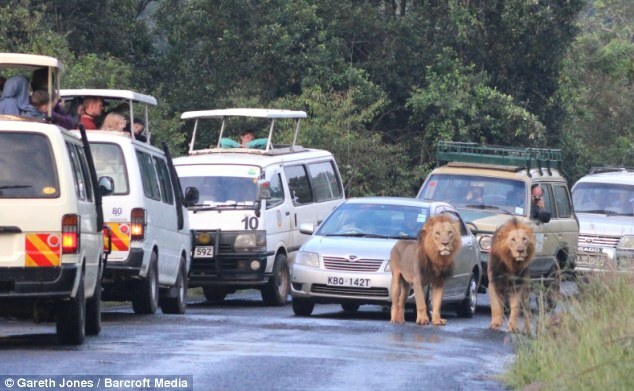 Two lions created Traffic jam in Africa - nobody complained, rather people enjoyed it ! At Nairobi National Park in Kenya, two male lions were on a stroll in the morning and created a traffic jam for 10 minutes. Interestingly, nobody complained about the incident, rather people were out of their sunroofs and enjoyed the rare view. The Lions, as you could see in the Images just came for a stroll, drank some water on the roads, entertained people and went back to their regular business. Nobody is reported to be hurt during the incident. More Images could be viewed here.